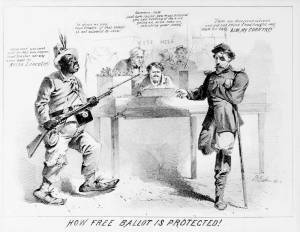 "How Free Ballot is Protected!" The artist charges the Republicans with electoral fraud and obstructionism in their efforts to defeat Democratic presidential nominee George B. McClellan. Oblique reference is also made to Lincoln’s supposed advocacy of equal rights for blacks.